I have been using this water to wash utensils, my clothes, cleaning the house and taking bath. The water is usually soft and clean which clears dirt from our clothes and the soap use is low compared to the hard water at the Muuthani River. 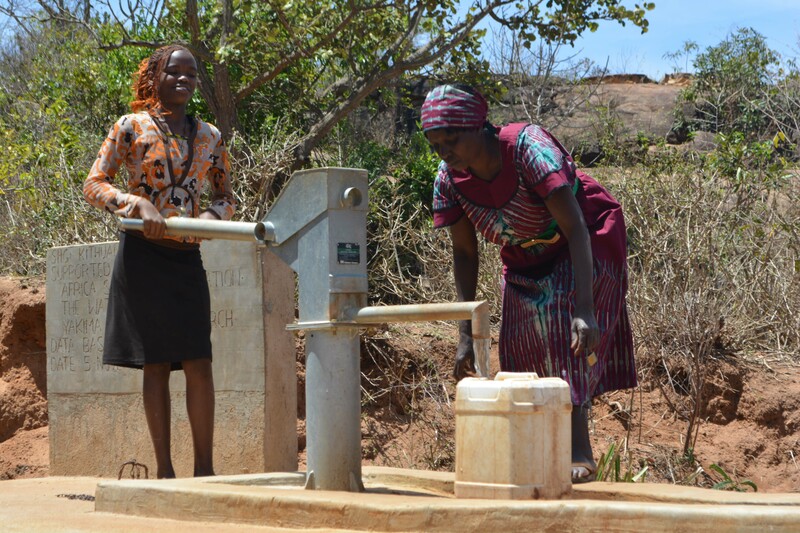 A year ago, generous donors helped build a hand-dug well for the Kithuani Self-Help Group in Kenya. Because of these gifts and our monthly donors, partners are able to visit project sites throughout the year, strengthening relationships with communities and evaluating the actual water project. These consistent visits allow us to learn vital lessons and hear amazing stories – we’re excited to share this one from our partners Titus Mbithi and Mutheu Mutune with you. People in this area have grown trees for betterment of the environment using water from this well and dam system. The project has supported them with water for domestic use and also for watering their livestock. The community members have started irrigating their farms with this water, and some have planted kales, spinach, maize, yams, arrowroots and sweet potatoes. These kind of crops are highly nutritional, and once sold fetch a good income that is used to improve standards of living. And thanks to the surplus of water an adjacent sand dam provides, this hand-dug well is able to pump clean, safe water from the catchment area. 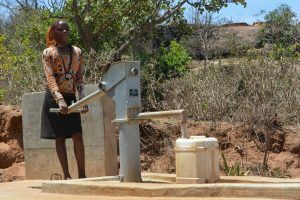 Anne Ngei is the chairwoman who oversees this water point’s management and maintenance. She met us there to talk about the developments in her area since water came. “Life after this project has become very good because the distance to water points has decreased to less than a kilometer, and we use our time well. We have been able to run businesses, take care of our farms, and run our errands without stress… we are grateful for the various trainings we have received. They have made me become proactive. My children are picking up after me and they are slowly starting to follow the things that I do, such as treating drinking water, terracing for soil conservation and washing hands after toilet among other things. My granddaughter used to fetch water after school at Kyalai River, four kilometers from here. She’d find long lines and later come home late and this was very risky for her. Currently she only takes less than five minutes to get to the project and gets back to read for her KCSE exams,” she shared. 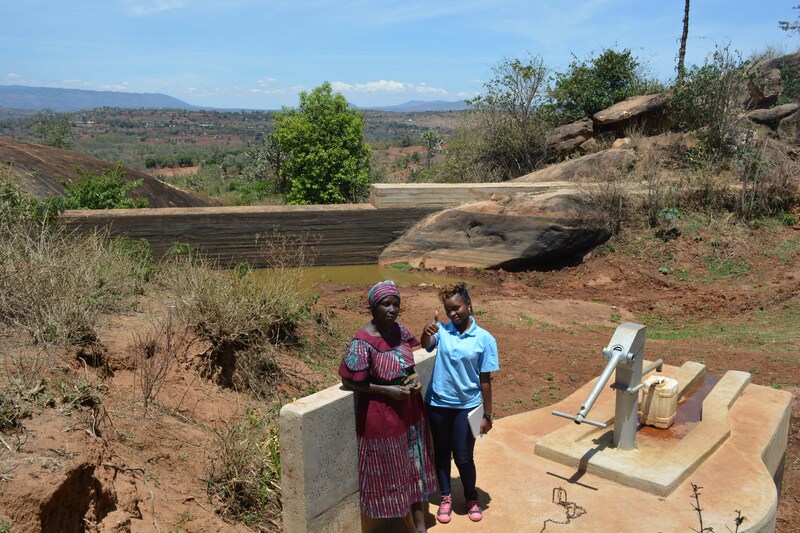 Anne Ngei and our field officer posing at the well. Kithuani Self-Help Group is hardworking, and they have seen the benefits of this hand-dug well and sand dam and are using them to their fullest potential. They’ve been preventing soil erosion by digging terraces and planting cover crops, which also help to hold water in the soil. When you invest in The Water Project, you're investing in people like Diana Mwende. Your gifts help us reach more communities with the gift of clean, safe water. And every drop helps unlock potential.